With Christmas just around the corner, I thought it would be fun to take a look at the evolving image of Santa Claus over the many years. Illustrators have played a crucial role in shaping our modern day perception of jolly ol' Saint Nick. While today we think of him as a rotund man in a red suit, white trim, and durable, dark brown boots, the joyous man in the white beard riding his sleigh on Christmas Eve did not always appear as such. 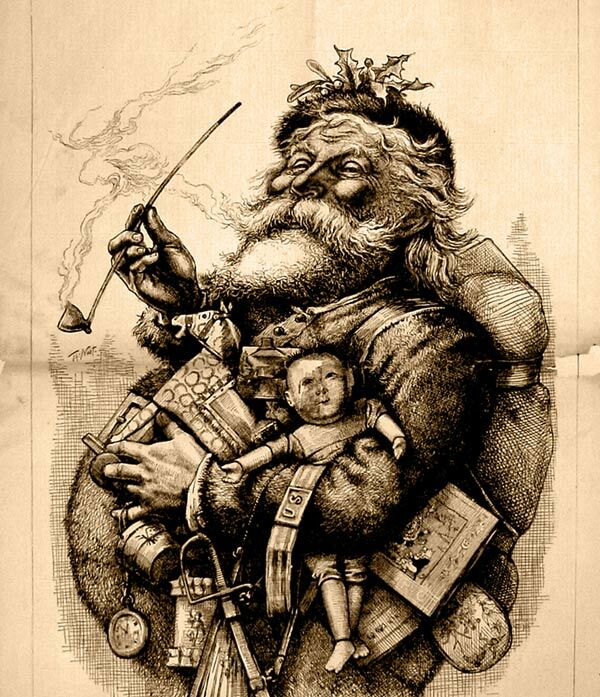 While Washington Irving and Clement Clarke Moore established a literary image of Mr. Claus, it was Thomas Nast's series of Santa Claus drawings for Harper's Weekly between 1863 and 1886 that established the look of the modern day icon. Prior to the twentieth century, however, Santa Claus' image was far from consistent. Arthur Rackham's Kris Kringle offers a European interpretation of the jolly soul. 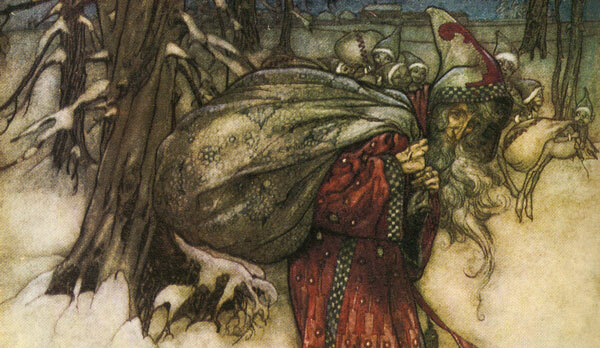 One of fantasy's most influential illustrators, the British Rackham presented Santa Claus as a mystical, tall, slender fellow dressed in a long, flowing robe, with white trim noticeably absent. It would take one of the United States' most important illustrators to establish, with finality, the true image of Santa. 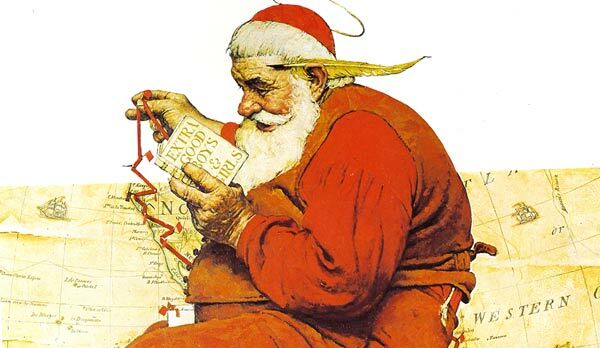 During the second decade of the twentieth century, J.C. Leyendecker offered the world a glimpse of the new Santa Claus; a man both jolly and round, with a noticeably ruddy complexion, dressed in a red suit (white trim included), a red cap, and the signature belt and boots. Indeed, the world now had a universal Kris Kringle! 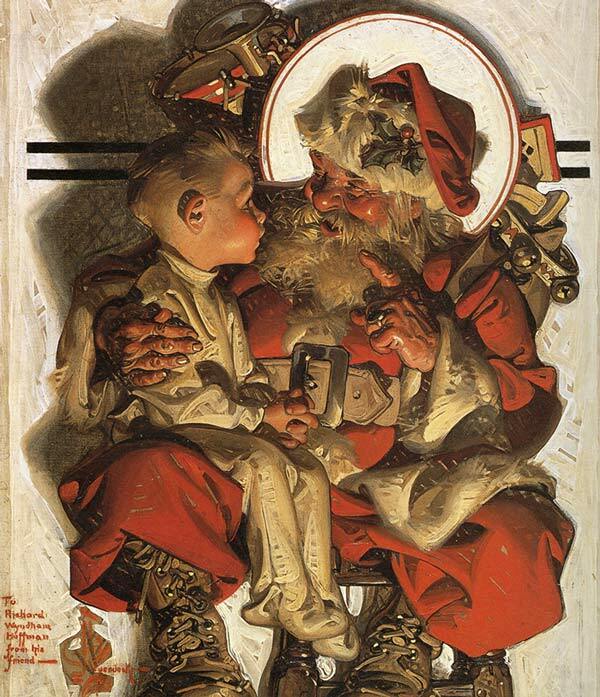 As Leyendecker continued to present this appealing new look, via the covers of The Saturday Evening Post, the public accepted this image as the one and only Saint Nick. The success of Leyendecker's interpretation was reaffirmed during the 1930's, during which Coca-Cola launched an unforgettable marketing campaign that incorporated the jolly man in red into their illustrated advertisements. 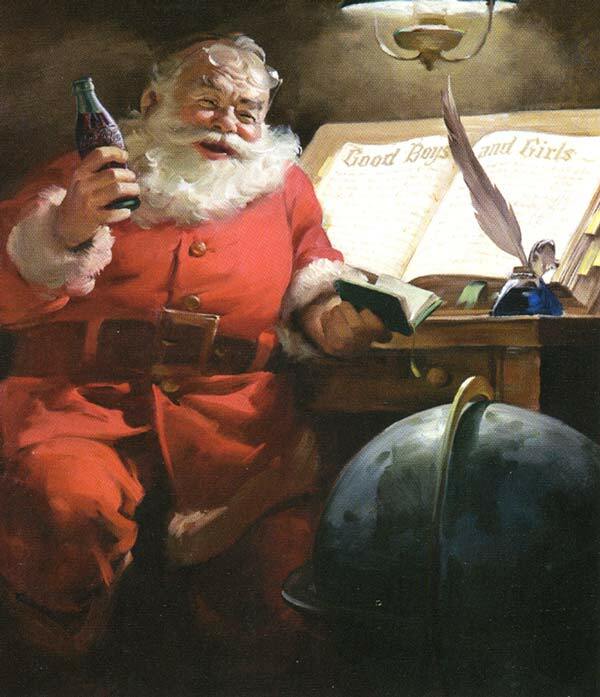 Haddon Sundblom, illustrator of the Coca-Cola Santa, utilized the Leyendecker model to achieve a highly effective visual of Santa Claus. The red and white of his suit worked perfectly with the corporate colors of Coca-Cola. 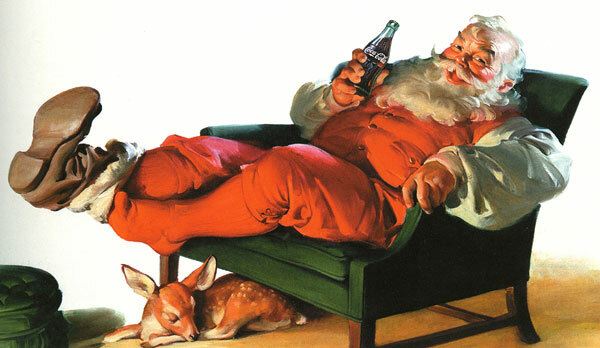 So successful was this iconic advertising campaign, that even today we continue to associate the American beverage with Mr. Claus. 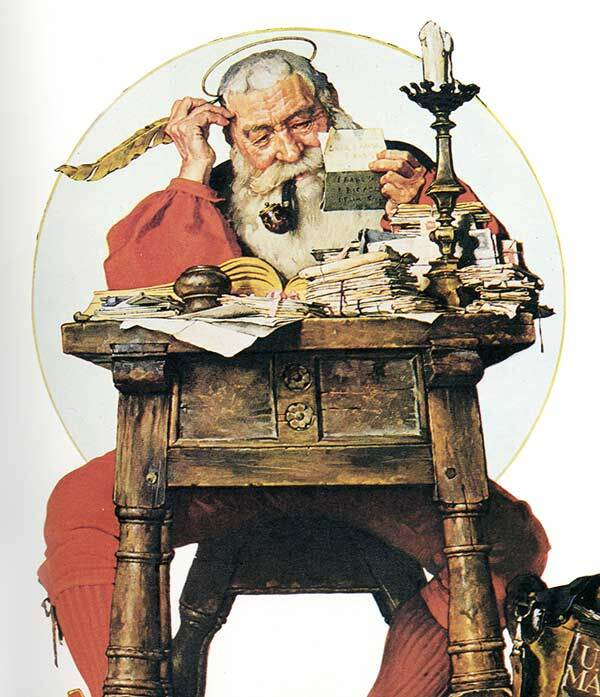 Of course, no discussion on the golden age of illustration is complete without mentioning Norman Rockwell, who further continued the formulaic model of Saint Nick. 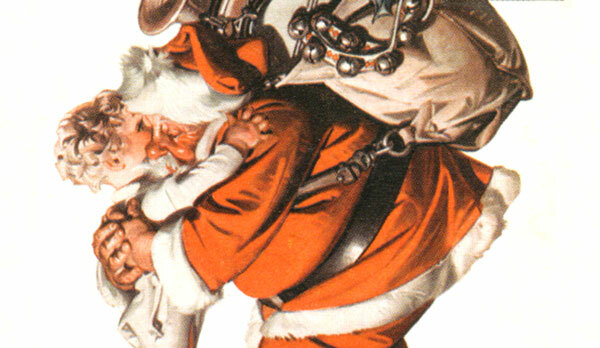 Where once, many years past, Leyendecker's Santas adorned the covers of the Saturday Evening Post, now those of one of his most avid, talented fans graced their covers. The evolution of Santa was now complete! Cutler, Laurence and Judy Goffman Cutler. J.C. Leyendecker. New York: Abrams, 2008. Finch, Christopher. Norman Rockwell: 332 Magazine Covers. New York: Abbeville Press Publishers, 1994. Menges, Jeff A. The Arthur Rackham Treasury. Mineola, New York: Dover Publications, Inc., 2005. Myers, Robert J. "Santa Claus." The World Book Encyclopedia: S-Sn. Chicago: World Book, Inc., 1990. Vann, Bill and Dan Zimmer. "The Art of Haddon Sundblom." Illustration, Spring 2008.